Sundakkai (Turkey Berry) is a special medicinal herb which is botanically called as Solanum torvum. You can prepare Kuzhambu, Sambar and Thuvayal with Sundakkai. 1. In a pan, add 3 tsp of oil and fry sundakkai till it get roasted well.Trasnfer to a small mixer jar and allow it to cool. 2. In the same pan, add 1 tsp of oil and fry urad dhal, red chilly and asafoetida.Transfer to a mixture jar, add tamarind paste, salt and coconut. 3. Add little water and grind the ingredients. 4. Serve with rice or any Indian bread. a recipe with this ingredient is a first! We use Chundakkaya for Vishu. 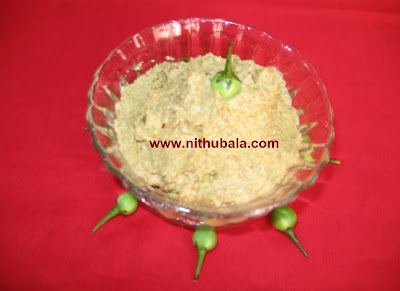 yummmmmmmmy I love sundakai in any form be it vatha kuzhambu or this chutney which looks very tempting and delicious. Something new to me..Must go & look for some turkey berry!! wow.....this is something new.....thanks for sharing. Wat a healthy chutney, delicious.. Very healthy and delicious chutney. I have never seen these berries. The chutney looks yummy. Nithu, I have tagged you in a game.Visit my blog to see the details. am doing gr8..sure will be in touch :) BTW love the chutney..healthy and tasty..